Students will be able to analyze and interpret data about leaf color. Collecting leaves from the playground, sorting, counting and recording data helps students practice a basic scientific skill - analyzing data. “Well did you know the leaves are actually red, yellow and orange all the time?” Most student look perplexed by this comment and I explain how the process of photosynthesis (we have discussed the process of photosynthesis in the previous day’s lesson – Green Is Good) makes the green color from chlorophyll the dominant color. The reason I discuss the word "dominant" with the students is because I like to take every opportunity to review my students scientific vocabulary. I like to take advantage of every teachable moment to add to the lesson. The word "dominant" came up naturally in context so I was able to take advantage of this and review an old word with my students. "Let's watch this short video clip to see a more detailed explanation." I have already loaded the short video clip onto the SMARTBoard for the students to see. I use this short explanation to engage my students attention. I use the video clip to reinforce the information I presented to the students. In this way the students received the same information in two different formats - one orally and one visually. Once the book is over I ask the students to take a seat around the edge of the rug by singing the “Edge of the Rug” song. Once the students are settled I pull out a big plastic bag which has five smaller bags inside it. Inside each bag is a collection of anywhere from 30 to 40 leaves from the playground at the back of the school. The reason I have collected the leaves is because of time. It would take too much time for the students to go out and collect the leaves and then walk back into the classroom to do the activity. I could have the students collect the leaves but I have found that the students tend to select the leaves based on color and this tends to skew the results. Another reason I collect the leaves is the fact that the weather can be unpredictable at this time of the year. If I have the leaves already collected then it does not matter if it is wet or cold because we already have the materials we need to complete the lesson. “While you are at this station you will sort the leaves by color. Now you may think this is easy, but take a look at this leaf.” I hold up a leaf that is multi-colored with orange and yellow. Allow the students 15-18 minutes to work on this activity. I remind the students to keep an eye on the visual timer so they will use their time wisely. The students in my class have worked on sorting and graphing during math and science lessons before and now I want them to use this skill to answer a question. I always start out this process by direct modeling which is how I will help my students during this lesson. Working in a small group of five students helps me by ensuring each student gets the instructional level they need. In this activity the students are exploring how the scientific skill of sorting and recording data. Then we analyze the data and use the results to answer a given question. When the students begin to identify the leaves they sorted they are elaborating on the lesson topic. Now we are not just recognizing the colors of the leaves but also the types of leaves they are. Student graphing leaf color 1. Student graphing leaf color 2. At one of the other integrated work stations the students are working on filling in a Fall Leaves sight word reader. I have the students trace stencils of local leaves and they must color the leaves the correct color to match the color sight word (ELA). At another station the students are playing a leaf game using little acrylic leaves I bought at Joann’s. Each pair of students has 10 leaves and a laminated game board which has a tree on it. The first student places the ten leaves on the “ground” under the tree. The second student then closes their eyes. The first student removes any number of leaves and hides them from view. The second student then opens their eyes and has to determine the number of leaves removed based on the number of leaves left on the ground. Once the second student gets the number right the students switch roles (Math). I place a number line at the table as a resource for students to use if they need it. For higher performing students I may use a larger number such as 15 or 20 leaves. 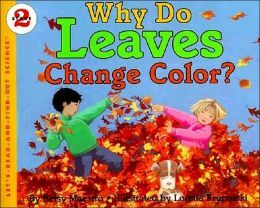 How Many Leaves Blew Away? At the final station students are using leaves to create an animal they like. Once the animal has been created, the student uses crayons to draw details of the animal’s natural environment (art – engineering). These activities provide the students with opportunities to explore leaves in different content areas. The activities allow students to expand their content skills while still maintaining a connection to the science lesson topic. Student using a book as a resource. Students working on leaf creations. When all four rotations of the integrated work stations are completed I blow two short blasts on my whistle and use the “Stop, look listen” technique mentioned above. After the timer goes off I use the fair sticks to determine the order of the students. Once a student has given me their fact and answered a related question they are free to use the hand sanitizer and go to get their snack. If a student has difficulty in coming up with a piece of information, they can wait until all of the other students have gone and we will come up with a piece of information together. I use this exit ticket process as a way for the students to explain what they observed from the lesson we just did. This quick assessment process allows me to see if the student is able to take information learned in one format and be able to transfer it to another format. In order to assess if my students have successfully understood and retained the information presented in the lesson I evaluate each student by providing them with a task the next day for morning work. For this assessment I place the following assignment sheet at each student’s seat. The students’ are asked to fill in the graph, look at the data and use the data to answer the questions at the bottom of the page. Some of my students will be able to work on the assignment independently. Other students will need to have the assignment and questions read to them, but will be able to work on the task by themselves. For my lower performing students I will need to read the directions, direct where to put their information, read the questions and point out where they need to write their answers. The reason I do not have students work in pairs on this assignment is because the more advanced students tends to tell the other student not only how to do it but what to write. This means I do not get to see what the other student can accomplish.